If the life insurance industry had to choose a theme song for 2014 and 2015, it would likely be Bob Dylan’s “The Times They Are A-Changin.” Thanks to continued downward pressure on interest rates and changes to estate tax law, carriers, BGAs and advisors are being forced to adapt, evolve and innovate. Keep reading to learn how these tectonic shifts are impacting the life insurance business and discover which emerging sales concepts are proving to be successful in these tumultuous times. 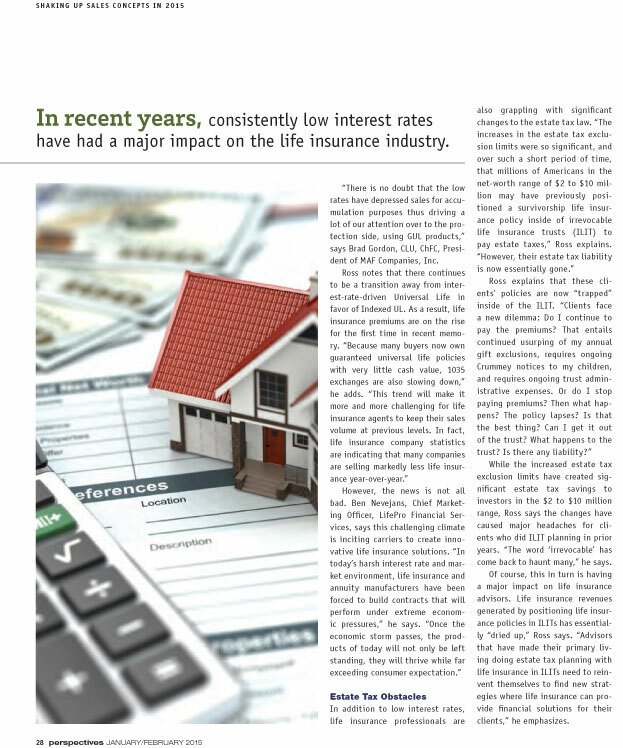 In recent years, consistently low interest rates have had a major impact on the life insurance industry. Unfortunately, experts do not predict any major interest rate increases in the near future. In October 2014, the Federal Reserve Chair forecasted the first potential first rate increase will take place in the spring of 2015—but that boost depends on the strength of the economy. If inflation levels remain weak (below 2 percent), the Federal Reserve will continue to keep interest rates low. Joe Ross, ChFC, CLU, CRC, Vice President of Sales Productivity & Business Development with AIG, says low interest rates are continuing to squeeze insurance company profit margins. “Insurance companies are reluctant to accept very much single-premium business because we don’t have places to invest the excess premiums to generate enviable investment returns,” he explains. He points out that insurance companies are under significant pressure to increase premiums, especially on guaranteed death benefit universal life policies.